Version 6.4.2 for is a FREE upgrade for registered users of Version 5.x and 6.x. When you start Ver. 6.4.2, it should automatically open up in its registered state. If that does not happen, enter your username and registration code. Fixed a PCT searching issue that was caused by changes at WIPO. Thanks to Ed who reported the PCT searching issue! Also, many thanks to the numerous Patent Grabber purchasers for their suggestions! Create a Claim Report or an Abstract Report from any list of patents. This function was previously only available for using with search results. Now you can use those features with your own list of patents. Choose search field codes from a dropdown list. The list automatically adjusts depending upon whether you choose a U.S. patent, U.S. publication, EPO or PCT publication search. Each can be saved or printed. The saved list of patent family information will be in tab-delimited format for easy importation into a spreadsheet or word processing table. Patent Grabber 6.4.2 for Mac requires an Intel Mac (runs natively as a "universal binary" application). OS X Snow Leopard (OS 10.6.6) or later is required. Patent Grabber 6.4.2 for Windows requires a PC running Windows 7 or later, plus the free PDFTK.exe helper application. Patent Grabber is initially in a free Evaluation Mode (limited to downloading one patent at a time, creating an regular spreadsheet of up to 10 patents, or downloading a single INPADOC legal status summary). Licenses may be purchased online through Avangate. Family-izer now works without the need for a browser plugin! What's New with Ver. 2.5: added two columns of statistical information. The first column shows the number of patents in the family. The second column shows the number of unique countries and/or regions in the family. Please see the Family-izer page for more information. What's New: Ver. 1.3 adds a new function called "Unique Forward Cites." Instead of creating an entire forward citation tree, the Unique Forward Cites function lists only the unique patents that would be found in a full tree. 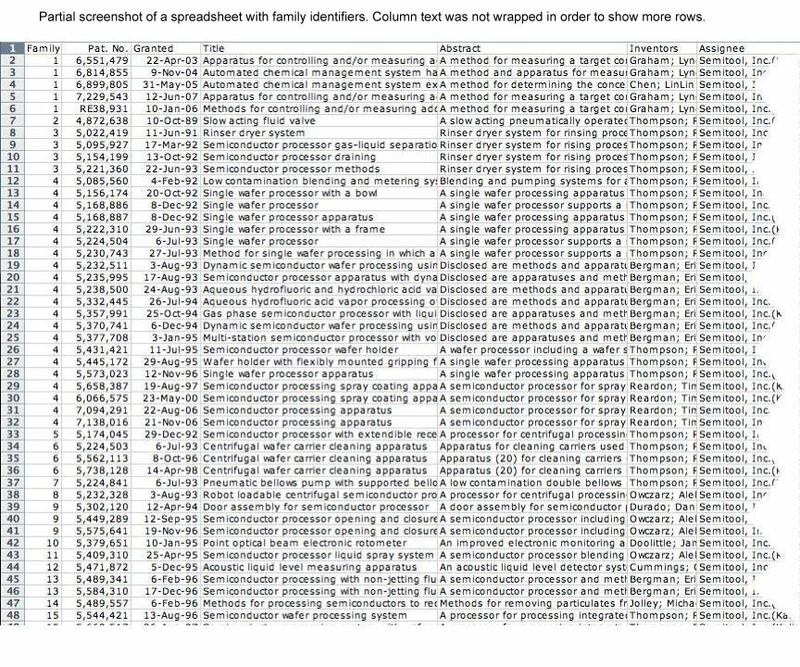 It also lists the number of times each patent would appear in the full tree, the first generation in which the patent would appear in the full tree (for ease of sorting and filtering in a spreadsheet), and all of the generations in which the patent would appear in a full tree. Also, the default number of generations is now 1 rather than "all" since the number of direct foward citations that a target patent has likely provides the most immediate information concerning the target. Additionally, a bug caused by the USPTO's addition of a note about a certificate of correction to the text of every patent that was the subject of a certificate of correction has been fixed. That bug had prevented Forward Citation Generator from retrieving the title of any patent that was the subject of a certificate of correction. 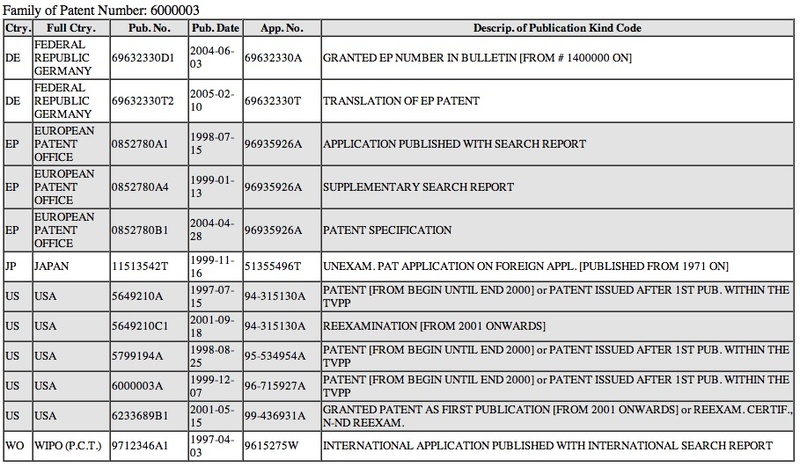 The Forward Citation Generator takes a target U.S. patent and retrieves the patent numbers of all subsequently granted U.S. patents that cite the target patent (the target patent's "forward citations"). Those forward citations of the target patent are the 1st Generation forward citations. The number of 1st Generation forward citations of a target patent is considered to be a rough measure of the importance of the invention claimed in the target patent. The Forward Citation Generator can then go through an iterative process of retrieving the forward citations for each 1st Generation forward citation to obtain the 2nd Generation forward citations, and then go through the same process to obtain the 3rd Generation, 4th Generation, etc. forward citations until it reaches the point where there simply are no further forward citations (users can manually limit the number of generations, if they wish, to a number from one to fifteen). Once the last generation is reached, the Forward Citation Generator will download the text of every patent that was cited and extract basic bibliographic data (issue date, assignee, title and main class/subclass). The main class/subclass numbers are supplemented with the full description of that class/subclass (a text file that comes with the Forward Citation Generator provides the descriptions). the number of branches in the entire tree. The length of time it takes for the process to be completed varies with the number of forward citations that the target patent has, and the number of forward citations that the succeeding generations of forward citations have. For example, 6,001,234 takes little more than a minute for four generations, while 5,000,000 takes about thirty minutes for twelve generations. Once finished, the results can be saved as a text file that can be imported into a spreadsheet and studied, filtered and otherwise manipulated. While 1st Generation forward citations are thought of as a measure of the importance of an invention, what is the use of the subsequent generations? Is there anything to be learned by tracing the forward citations of 5,000,000 ("Ethanol production by Escherichia coli strains co-expressing Zymomonas PDC and ADH genes") to 8,088,548 ("Bottom antireflective coating compositions") in the 12th Generation? I don't know, and that is why I am providing the Forward Citation Generation for free. Just provide attribution and abide by the other license requirements and I will be happy. Of course, I will be even happier if users let me know how they are using this application! Forward Citation Generator 1.3 for Mac requires a PowerPC or Intel Mac (runs natively as a "universal binary" application). OS X Tiger (OS 10.4.x) or later is required. Forward Citation Generator 1.3 for Windows requires a PC running Windows 2000 or later. License: There is no license fee. A license screen will appear each time you start Forward Citation Generator. Simply abide by the license requirements and you are licensed. WINDOWS is a trademark of Microsoft Corp., ACROBAT is a registered trademark of Adobe Systems Incoroprated, HYPERCARD is a registered trademark of Apple, Inc. (formerly Apple Computer, Inc.). PATENTSCOPE is a registered trademark of the World Intellectual Property Organization.